An art-inspired gift that makes learning to name and explore wildlife a family adventure. Larger-than-life black and white drawings are paired with poetic texts that reveal the ways in which endangered creatures – including lions, elephants, giraffes, tigers, gorillas, penguins, Ethiopian wolves, macaws, turtles and zebras – live on Earth. Artworks by wildlife artist Stephen Walton are rendered in charcoal and give little ones the chance to get up close and personal with nature’s wildest creatures. Virginia McKenna – actress and wildlife campaigner – has written a foreword which urges us to look at the beauty of these animals and do all we can to save them. 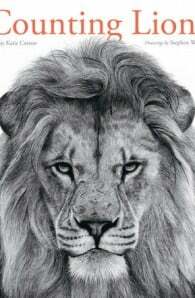 A 5% royalty will be donated to her Born Free foundation. Katie Cotton studied English at Oxford University before becoming an author and editor of children's books. She lives and works in London. Stephen Walton is a self-taught, award-winning artist who works as Supervisor at Bury Art Museum in Manchester, UK. After studying Geography at Manchester University, his artwork developed alongside his love of taking photographs, which resulted in his very particular style and method: when he is out and about he takes photographs which he then draws from at home. His incredible charcoal artworks can take up to a month to complete. 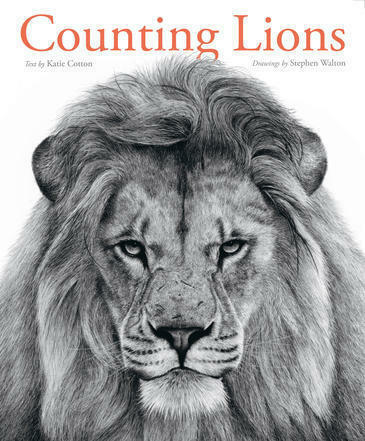 Counting Lions is his first fully illustrated book. Stephen lives in Manchester, England.